Today’s story begins, as so many do, with a mysterious woman finding an ancient amulet in the desert. The caption says “the figure of a woman moves swiftly down into a new archeological excavation,” which explains why she can pluck a treasure off the ground and carry it away with her. This must be a terribly relaxed archeological excavation, if figures of women can just walk in and help themselves to the merchandise. Then we move on to a tomb still undiscovered by archeologists, so it’s been a rough week for archeologists so far. It turns out this figure of a woman is actually Isis, the Egyptian goddess of nature and magic, and the amulet belongs to her brother and husband Osiris, the god of death, resurrection and rebirth. 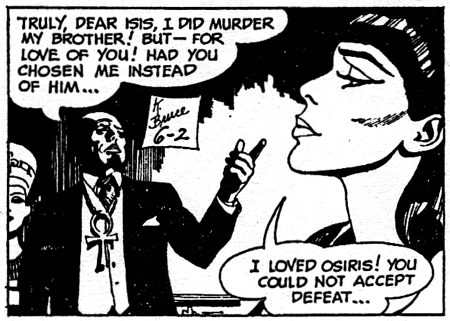 But Osiris apparently ran through his regeneration cycle sometime in the last four thousand years, because she’s proclaiming, “Soon… very soon… I, Isis, shall find your soul!” Most Dark Shadows stories are about “the past,” but this one is even more “the past” than usual. So we turn, once again, to ancient Egyptian mythology, about which: what the hell. Has there ever been an ancient culture better tailored for adventure-story cultural appropriation? Like the Greek and Roman gods, they have personalities and conflicts, and they interact with the world — or so I’m led to believe from all the adventure-story appropriation. But the Egyptian gods have an advantage that the Greeks and Norses don’t — strong, exotic visuals. Pyramids, hieroglyphs, ankhs, scarabs, elaborate paintings and jewelry — all of it gorgeous and detailed, and so much fun for visual storytelling. Ken Bald, who drew the strip, is clearly enjoying himself, sticking as many Egypty motifs into the frame as he possibly can. Plus, all of these visuals connect to themes of power and death — the eye-catching art and adornments are all based on the tombs of powerful emperors. A sarcophagus isn’t just a beautiful object, it’s also a dead guy — and a famous dead guy, at that. How could Dark Shadows possibly resist? Anyway, Osiris was reborn in a human body, or so we’re meant to believe, and you’ll never guess whose they chose. It’s Barnabas, of course! Man, when you’re looking for something, it’s always in the last place you look, isn’t it? I don’t think anybody saw this one coming. 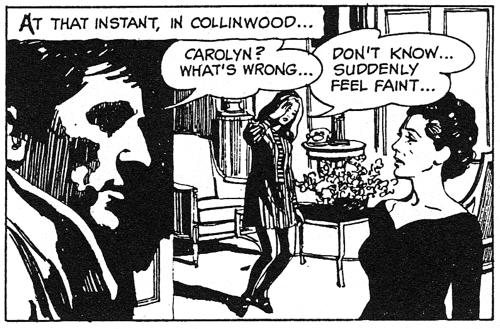 But in defiance of the rules of soap opera, this comic strip is entirely about Barnabas — Elizabeth and Carolyn are background figures, waiting around for their turn to be imperiled, protected and misinformed. Barnabas is effectively the only character in the strip, so if somebody has to have the soul of Osiris, then who else could it possibly be? 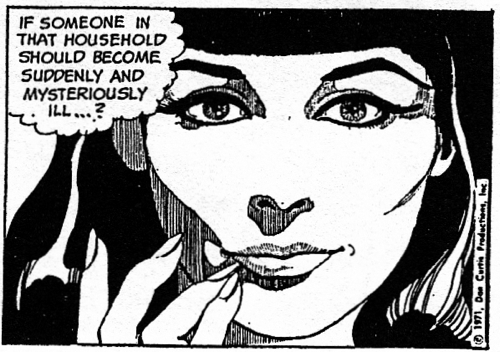 They could invent another Collins ancestor, of course, or have a new Osiris-y visitor staying at Collinwood. But then Barnabas would fade into the background too, as he kind of did in the last story when Eban and Mathilda asserted themselves. 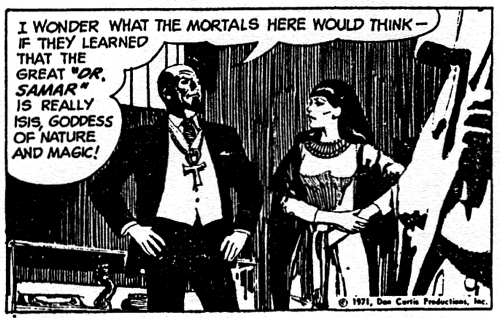 So if we have to do a story about ancient Egypt — and obviously, in the 1970s, we do — then Barnabas is suddenly half-Egyptian, on his mummy’s side. 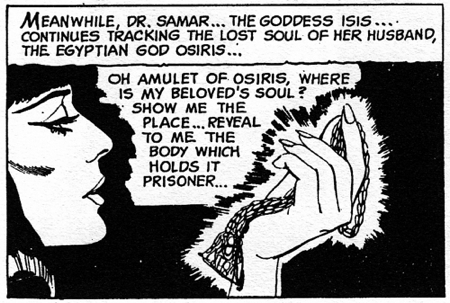 And in the next panel: “Meanwhile, Dr. Samar… the goddess Isis… continues tracking the lost soul of her husband,” as if that’s a perfectly normal plot detail to throw into a caption. I mean, imagine waking up on a Sunday morning, and finding that in your newspaper. That could put a crimp in your whole weekend. By the way, it’s kind of insensitive to mention General Hospital, just six weeks after Dark Shadows was booted off the ABC daytime lineup. Next, Isis is going to complain that all her children only have one life to live. And then he just keeps on having thinks about it, and she does too. They actually do a whole week of thinks, just bouncing back and forth between Barnabas and Isis. This reads okay in a reprint collection, but it must have been frustrating for newspaper readers, just watching people think about each other for six straight days. So you’ll never guess what happens next. Dr. Samar — one of the world’s outstanding authorities on rare diseases — prays to the great god Ptah. Ptah, as you know, is the demiurge who existed before all things, and conceived the world by a thought. He’s the creator, who made the world and everything in it. So obviously, he’s totally down for vising rare maladies on random chicks in New England. By the way, I don’t know where Isis gets off with this “mortal known as Carolyn Stoddard” thing. For all she knows, Carolyn could be Loki, or Judah Maccabee. Once you open the door to people being things, it’s hard to know where to draw the line. So Ptah ptakes care of things, striking Carolyn down, right in the middle of one of Barnabas’ pointless social calls. We see Barnabas, Carolyn and Liz all standing around in a parlor, pointed in completely different directions. What were they up to, just before Carolyn got sick? I don’t really understand this comic strip lifestyle. Then a bald guy with an aggressive chinbeard and a desperately fashionable ankh necklace appears, and starts throwing shade at Isis. She closes on that as if murdering his brother is the shocking part of this revelation, rather than the whole core of this mythology that people have known about for four thousand years. This part would actually surprise the archeologists, because as far as I know from my casual skim through Wikipedia, this isn’t supposed to be a romantic triangle. But the soap tropes win again, converting everything in their path into a love story. Set and Isis are brother and sister as well, if you’re interested. 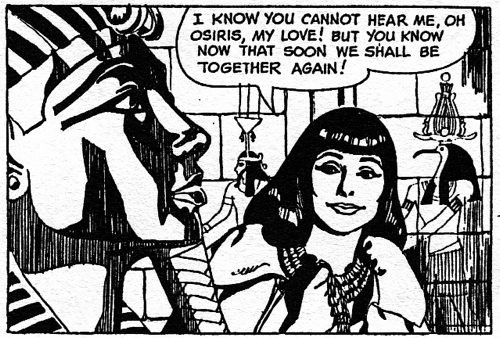 The only god in this story that she’s not directly related is Ptah, who she introduced herself to as “your sister goddess.” This is going to be quite the family reunion for Barnabas. Naturally, when the local doctor can’t diagnose Carolyn’s rare malady, they call in the expert, Dr. Samar. She shows up in full Egyptian goddess drag, with a cape and everything. She mixes up an ancient potion in a little bowl, and tells Barnabas and Liz to clear the room. “I insist on being alone with my patient!” she says, showing more leg than you’d imagine an outstanding authority on something ever could. “My methods are perhaps unorthodox.” Yeah, no kidding. I can’t imagine what medical school must have been like. Carolyn gets better within two panels, of course, because this isn’t a story about Carolyn. It’s all been leading up to this big moment, when the vampire Barnabas Collins and the goddess Isis look deeply into each other’s eyes. “Have we known each other before this moment?” he breathes. “Perhaps in another time, in another life?” She takes this in a big way, although honestly, Barnabas says that to about forty percent of the females that he ever runs into. Finally, after three solid months on this comic strip, Barnabas unleashes the fangs. 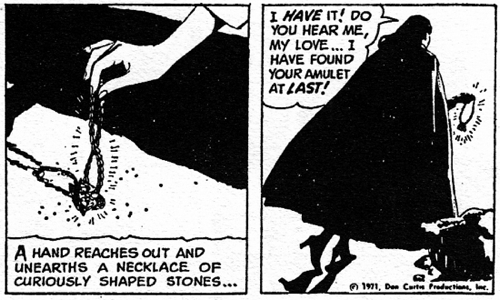 The next day’s strip asserts that the bite of love “is the act of supreme adoration,” which is clearly fanservice for the woman who used to send naked pictures of themselves to Jonathan Frid, who was not particularly interested in them. So. Do I even need to unpack this, or can we just flag it as another fantasy-metaphor sexual assault, and move on? Because that’s not the closing act of this peculiar party. The goddess bounces back from the bite with no visible effects, and instantly hypnotizes her partner with the magic amulet. So these two really are made for each other, aren’t they? They both share the same interests, namely: forcing other people to love them against their will. I know that people like to speculate about who the ideal woman for Barnabas is, but this one is clearly nailing the job interview. From now on, I ship Barnabisis. What newspapers did this comic strip appear in? It was syndicated nationally, but I don’t know how many papers it appeared in. Darkshadowsonline.com gives the ‘Newspaper Enterprise Association’ as the syndicator. 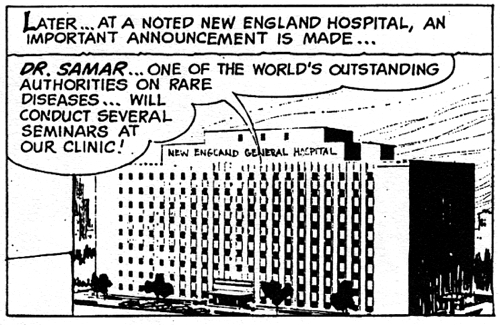 I know the Detroit News carried it, but at that time, it occupied the same place in my young world as Mary Worth or Rex Morgan, MD (ie, ‘girl stuff’, potentially infested with cooties). After this adventure, Isis became an international terrorist..